Since opening in August 2014, the Rideau Centre's new food court has presented some interesting new food choices. Big Smoke Burger and MLT Down have provided some interesting dining concepts. 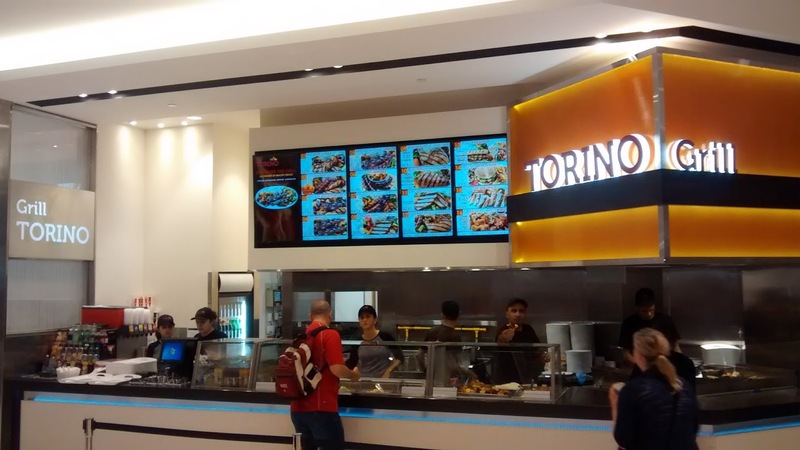 Last Saturday upon starting a downtown shopping trip, I decided to try out one of the other food court restaurants that seemed interesting: Torino Grill (50 Rideau Street, Ottawa). The restaurant is supposedly a Mediterranean inspired grill that specializes in grilled chicken. The menu seemed promising with various grilled chicken and other Mediterranean inspired dishes. It was a 11:30 A.M. on Saturday and I approached the counter. One of the employees behind the counter trying to encourage passing customers to visit the restaurant's storefront by offering chicken samples. If you fell for the bait, he would quickly get into his sales pitch to explain the chicken was in such a such dish and today's specials. Nice salesmanship if you can encourage more customers to come forward during your slower times before and after the lunch rush. I of course took advantage of the free sample and took the opportunity to order. The only problem, the samples were handed out near the cash register at one end of the counter while the actual line up to order was the opposite side. No worries, I was able to order with the lady standing beside the gentleman slinging free chicken pieces without interrupting the other two customers who had already ordered. 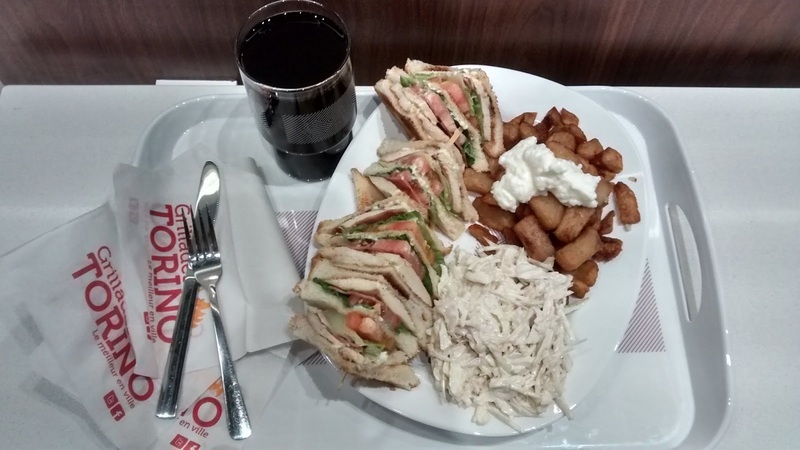 The Order: 1 Club Sandwich combo with two sides (1 fries and 1 coleslaw). My order took a little time to prepare. The club sandwich came out of the back of the restaurant as opposed to over at the grill. No worries at least the sandwich was together. A nice touch of Torino Grill is the choice of sides that are available. There are an estimated ten different options to choose from with each menu item having a certain number (i.e. 1, 2 or 3 sides) available included in the single price. Each menu item, of course, has suggested pictures to wet your appetite on the menu including what could be considered suggestions for sides. In the Club Sandwich menu entry, for example, there were fries nestled next to the triple stacked sandwich pictured. The so called "fries" pictured on the menu looked like shoe string cut fries. So imagine my surprise when hashbrown sized potato wedges were served up. Not sure if this was due to a cutback by head office, over supply of hashbrowns sized potato wedges (garlic potatoes sans garlic?) or simple mistake by the staff. Whatever it was, it wasn't the fries I had in mind. I didn't complain just figured these wedges were worth a try. Add in the offer of humus for no additional charge and it didn't seem to bad. I took my plate to find a seat in the already filling up mall food court. The sandwich was nothing special. Straight plain white bread with average chicken, lettuce, tomato put together and put on a plate. No extra taste, no seasoning, no freshness, no nothing, just lackluster. The "fries" were simple fried potato hashbrown wedges served up similar to any pub. Nothing special here either. No seasoning to make it just perfect, just simply cook it and serve it. The hummus was also nothing special. No "grandma's recipe" type take either. Just straight bland hummus made from some corporate recipe probably. Remember "Chicken Man" tempting passing prospective customers? All throughout the time I enjoyed my meal he was still slinging his chicken samples. Even when the counter was lined up with hungry lunch time customers he didn't stop. He was even, at times, standing in the way of his coworkers trying to prep orders and move them towards the cash. Instead of paying attention to the ever changing scene around him, he was more interested in slinging his chicken to passing customers instead of helping his coworkers to increase the pace of the growing line in front of him. Overall, Torino Grill has plenty of promise the chicken sample was good and an eager staff. However, slinging chicken samples that disrupts the orderly pace of a busy lunch time. Serving up potato wedges in place of fries is also a little questionable and probably borders on false advertising. A decent grill restaurant with a Mediterranean flair would provide a welcome addition to the Ottawa scene. This restaurant has great potential but only if service and food is stepped up.